This was a growing issue for the Severn Bridges connecting England and Wales, The first bridge opened in 1966 to replace a ferry service from Aust to Beachley. The Severn Bridge has carried more than 300 million vehicles to date, and over time, traffic volumes have been increasing heavily. The Second Crossing opened in 1996 to alleviate traffic congestion on the first Bridge. The two crossings are now overseen by the managing company, Severn River Crossing Plc, and these must be kept in the best possible condition. Due to the high volume of traffic using both crossings, caring for their upkeep is of the utmost importance. As part of its duties, Severn River Crossing must perform regular maintenance work and carry out any necessary repairs. As well as increasing traffic volumes road users were increasingly demanding to pay by card. This issue became even more urgent in 2010, when the Ryder Cup golf tournament was on its way to the Celtic Manor Hotel in Wales,. A card system was put in place for this event but it quickly became apparent that it couldn’t cope with the ever increasing volume of card transactions. It led Severn River Crossing to urgently require an efficient card system that would keep traffic moving quickly. It therefore turned to APSU, which implemented a turnkey card payment solution to integrate with Severn River's existing tolling system. 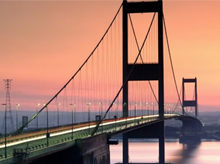 The solution has allowed the crossing to efficiently accept credit card payments, helping to support increased traffic flow across the Severn Bridges. We had put in place an interim solution to take cards, but we needed something more permanent. We wanted a turnkey solution, so we went to APSU and asked for a payment system that could be bolted on to the existing Tolling System. The solution is incredibly secure and has also reduced costs on cash handling. The solution is incredibly secure and has also reduced costs on cash handling. Mike Gudgeon, Commercial Manager at Severn River Crossing explains: "We had put in place an interim solution to take cards, but we needed something more permanent. We wanted a turnkey solution, so we went to APSU and asked for a payment system that could be bolted on to the existing Tolling System." Speed is of upmost importance for Severn River and as such, congestion must be managed: the crossing can see upwards of 200 cards per hour per lane at peak times and has 21 toll lanes, although the vast majority of cards going through just 10 of these. Severn River Crossing also required that the system was fully managed and able to function 24/7 to meet the growing needs of users. Gudgeon says: "This is a high volume, low value system. What is absolutely key to us is the speed of the transaction." The solution is already a big success. Since the system was first installed, card use at the tolls has climbed dramatically: in 2013, Severn River Crossing took 2.4 million transactions - nearly double the 1.3 million it took in 2012. In 2014, it saw 3.3 million card transactions with a total value of £24m. Severn River's system was a complex requirement and this meant implementation was a technical challenge at times. But this is a challenge that APSU was more than equipped to meet. According to Chris Boyes, Director of Technical Services at APSU: "In most environments you put card in, put in the pin, get a receipt and take the goods. But Severn River's needs are unique as there are several differing charges for either a car, van, lorry - so it was a challenge to get that coded." As well as having the ability to enable credit card payments, the solution needed to ensure the crossing was compliant to the Payment Card Industry Data Security Standard (PCI DSS), and continue to maintain this through the period of concession. Boyes adds: "We developed a custom solution just for their needs; APSU also provided the PCI payment standard support. It complies with the current standard, PCI version 3, and will update as this changes." To ensure optimum levels of security, APSU deployed Remote Managed Services for Wintel, Comms and Security; APSU Infrastructure solution based on HP Servers/Storage; Cisco/Tripwire Security Solutions to manage PCI compliance; and corporate NW and Email Security. The solution includes network based security, and hosted based security systems that are constantly monitored 24/7 from APSU's centre. Boyes says: "It's all about security: we are focussed on providing Severn River and their customers with a secure method of payment and it's met the required level of standard in the industry." This level of maintenance was also essential for Severn River, as it lacks sufficient IT specialists available 24/7 in house to manage such a large project. We have a small maintenance team of three maintaining the Tolls, but they are not IT specialists who can react to data breaches. APSU looks after all of the card system: hardware, software, patching as well as the PCI DSS regulation monitoring and support. If we have problems, we hand over to APSU. It is effectively a black box system. The project has already yielded great results. Its success has led Severn Bridge and APSU to extend their agreement further and the two firms are now planning to implement contactless payments via credit cards. The additional speed provided by this type of transaction will come at the ideal time for Severn River. It is predicted that the crossing will see 4 million credit card transactions in 2015 - and the system is built to take 5 million plus. Gudgeon explains: "The card readers are available now and we will be putting in the new hardware with help from APSU during first half of this year." He adds: "We have a system that works well for us, we are happy with the service: we can get hold of APSU 24/7. They monitor and get alerts when there is a problem. It works so well that they often tell us when there is a fault before we even see it. In three years, we have only had a few hours of downtime."